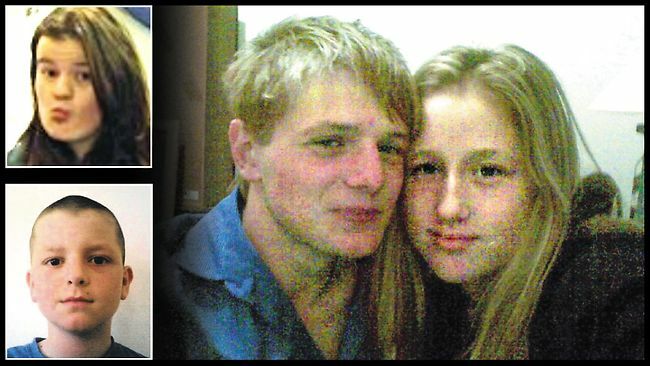 Sammantha Fowler (right) died after an argument with her mother, according to boyfriend James Elks (pictured with her). Matthew and Melanie Maher were also found dead. A MOTHER who had an argument with her eldest daughter is believed to have killed her three children before setting their house on fire and committing suicide. And the father of two of the children has blamed authorities for failing to protect them. Kylie Maher, 36, and her daughter Sammantha, 18, fought at the Heidelberg Heights house on Sunday. Sammantha's boyfriend James Elks has told police he was stopped from entering the back door with his girlfriend by Ms Maher. He has said he saw the pair argue before he tried to get neighbours to help him force his way in. It is not known if the other children, Melanie, 13, and Matthew, 11, were alive at the time. The coroner has found that Sammantha Fowler, who lived in Skye, and her half-brother Matthew had injuries consistent with a sharp object, such as a knife. Police also believe Ms Maher, who also went by the surname Fowler, may have lit a fire in the kitchen that ripped through the house and burned their bodies. Investigators found the four dead family members in three separate rooms. Police and Metropolitan Fire Brigade crews arrived just after 4pm and forced entry into the brick veneer house but were unable to help anybody inside. Dom Maher, 35 - the father of Melanie and Matthew - said he had been "devastated" and "in shock" since police told him of his children's deaths. "She had psychological problems," he said of his former partner. Mr Maher, who lives in Hobart, said the family were known to authorities, who had failed to protect the children. "Last week I tried to contact her and this week I find she is deceased and so are my kids ... I'm totally devastated, I'm shocked," he said. "This should not have been allowed to happen." A friend of Sammantha said the teenager, who finished year 12 at Carrum Downs secondary college last year, was kind-hearted. Theresa Waters, who knew Matthew through his involvement in the North Heidelberg Junior Football Club, said he was a good kid. "You had to check if he was actually there because he was so quiet," she said. THE Heidelberg Heights children believed to have been killed by their mother before she set their house on fire have been honoured by friends and their school community. Matthew, 11, and Melanie Maher, 13, who were found dead in their Southern Rd home on Sunday, attended Olympic Village Primary School in Heidelberg West. Principal Libby Young said the two students were "respected" and "well loved" by everyone in the school community. "They were both incredibly bright students and participated in all school activities," she said. "They’re death is a loss to our Heidelberg West community and they will be missed by all their friends." Ms Young said Melanie had attended the school but had moved to Macleod College for high school. Tributes from friends have flooded Facebook and a tribute page was set up for the siblings yesterday in their memory. One friend described Melanie as "a great girl" who would "never be forgotten" while another friend described her death as tragic and unfair. The two children and their 18-year-old half-sister Sammantha, who lived in Skye near Frankston, are believed to have been killed by their 36-year-old mother Kylie Maher. An autopsy revealed that both Sammatha and Matthew had been stabbed several times "with a sharp object." The tragedy began after Sammantha and her 19-year-old boyfriend arrived at the house at about 4pm. The mother allowed her daughter into the house, but refused entry to her boyfriend. Police believe an argument then started between the mother and the daughter inside the house. The boyfriend has told police that he tried to get neighbours to help him get inside the house but by the time he returned Sammantha had been stabbed and was bleeding heavily. The brick veneer house then broke out in flames, which is believed to have been fuelled by an accelerant. Emergency crews arrived and forced entry into the house, but were unable to help the family members. Fire crews found the four bodies in three separate rooms. UPDATE 11.25am: HEIDELBERG Heights residents report feeling sad and unsafe after four people were found dead in a house fire. Three children were possibly among four people found dead in a house fire in Southern Rd, Heidelberg Heights yesterday afternoon. Emergency crews were confronted by the horrific scene at 4pm, discovering four badly-burned bodies after forcing their way into the home. The victims are believed to be a mother and her three children, with homicide detectives still in the process of identifying the remains while arson squad detectives are awaiting further analysis of the scene to find out what started the blaze. Residents told the Leader they were shocked about what had happened. Resident Helen said she had been crying over the incident. "It’s just so sad that something like this would happen in this area and that children are involved," she said. Another Southern Rd resident, Margaret, said it was shocking that something like this had happened in the street. "When we found out we had a bit of a cry because it happened in our street," she said. Margaret said that she didn’t know the family and they must have kept to themselves because she never saw them. Resident Lea said she felt scared that an incident like this had happened in the street and during the day. "I don’t feel safe in my own home any more," she said. A police spokeswoman said police were still waiting on the victims’ post mortem results, which should be finalised in the next 48 hours. Detective Sgt Rod Stormonth of the arson and explosives squad said investigations were continuing. "We are back here this morning to try to determine the actual ignition point and hopefully we will get an answer to that this afternoon," he said. He said the fire is believed to have started in the kitchen or living area. "It is probably not as bad as it could have been, but there is enough damage in here for us to spend a few days here to try and establish the cause and origin of the fire." Police have spoken with neighbours but are appealing for anyone who witnessed the fire or tried to help and has not already spoken to investigators to come forward. A number of cars were seen driving up and down the street around the time, and anyone who was in the area is urged to contact Crime Stoppers on 1800 333 000. No mention of father. Where was he? The head of the family whose job it is to guard against such mishaps as these. Did he desert the family or was he booted out like so many fathers? God bless these 3 innocent children.